Ministers also want new street lights to come with charge points wherever there’s on-street parking. 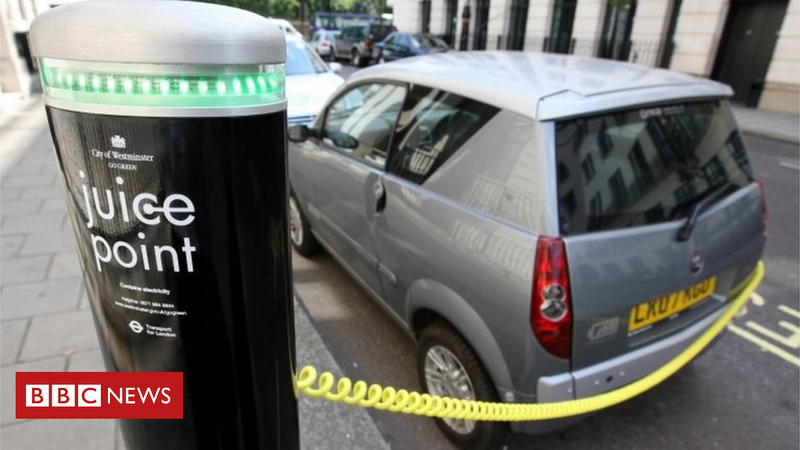 The proposals, announced by Transport Secretary Chris Grayling, aim to make it easier to recharge an electric car rather than refuel petrol or diesel vehicles. Mr Grayling said the proposed measures would mean the UK having “one of the most comprehensive support packages for zero-emission vehicles in the world”. “The prize is not just a cleaner and healthier environment but a UK economy fit for the future and the chance to win a substantial slice of a market estimated to be worth up to £7.6 trillion by 2050,” he said. The government’s Road to Zero strategy has been delayed by a dispute over what sort of cars should be allowed to be sold after 2040. The government’s climate change advisers say carbon emissions from vehicles must be stopped by 2040 if the UK is to achieve its demanding long-term targets for protecting the climate. That implies that cars after that date should be fuelled by electricity or hydrogen. But car makers like Toyota, which have specialised in hybrid petrol/electric vehicles, have been arguing that as most journeys are fairly short it doesn’t make sense to carry a battery big enough to make a 200-mile trip. It seems they have won their argument that hybrids should still be able to be sold – to the dismay of environmentalists who say the task of tackling carbon emissions from transport is going much too slowly anyway. The Campaign for Better Transport welcomed plans to increase charge points but said “overall the strategy fails to match the urgency of the situation”. It said new petrol and diesel cars should be banned by 2030 – ten years earlier than the government’s proposal – and criticised the “confusion” over the future of hybrids. The government has said it sees a role for hybrid technology in its new strategy. In the first six months of this year, electric vehicles made up only 5.5% of the UK’s new car market, compared with 4.3% over the same period in 2017. The RAC Foundation, a motoring research charity, found that growth in the electric car industry was hampered by a lack of widespread, reliable and easy-to-use public charging points. Research by the AA showed eight out of 10 drivers see the lack of charging points as a stumbling block to buying an electric car. The motoring organisation said the proposals were “a step in the right direction”, adding that “there is still much to do to wean drivers off petrol and diesel cars”.